Malt is one of the largest independent whisky sites in the world, read by up to 50,000 individuals each month. Edited by a regular contributor and reviewer to Whisky Magazine along with the man formerly known as the Whisky Rover, its aim is simple: to write about whisky with intelligence, a bit of fun, whilst occasionally asking questions that few writers seem to want to ask. Ultimately, it’s to provide readers with an honest critique of whisky and some of the questionable products or practices in the industry. 1. Drinks brands are intimately connected with leading publications and websites. That means they can help set the agenda – a little money for advertising can see massive features with little or no indication to the reader that they’ve been paid for. It’s the nature of the beast sometimes. But it can mean that poor whisky is celebrated. Facts are obscured by marketing. Money, in other words, ultimately talks. So how do you know what to believe about whisky? How can you sift through marketing spin to find really good products or brands? People actually buy whisky off the back of what’s said online, and whisky isn’t cheap. So it’s important that we tell it how it is so you don’t waste your money on poor products. Also, we want to point out to newcomers to whisky the poor practices – things that mean you’re not getting value for money. So if something is just flavourless, like Haig Club, we’ll say so. If something is a whisky disaster like Fujikai, we’ll openly tell you. Because if we don’t say something is bad, how can you trust us when we say something is good? Malt is run by Mark Newton, who’s written about whisky in publications such as Whisky Magazine, where he’s been one of the two lead tasters for 2017, Whisky Quarterly, Fieldsports Magazine and The Scottish Sporting Gazette, has been a whisky judge. He’s an experienced writer, having published several mass market genre novels, numerous short stories and magazine articles, and has even written for BBC Radio 4. For his day job, he works as a content specialist (so, more writing). Keep in touch on Instagram, on Twitter or Facebook. Riding shotgun is co-editor Jason, or JJ to those that know him personally. Heralding from a family well versed in whisky, particularly Bushmills, he was formerly known as the artist Whisky Rover. The website unleashed his own unique style of honest whisky critique articles, with a sense of humour since 2010 until the merger in 2017. You can reach out via Instagram. 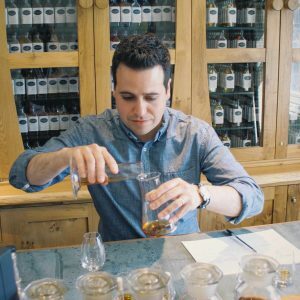 Being based in Scotland means that Jason is able to enjoy a wealth of distillery trips and whiskies, although it’s more than likely you’ll find him in the Edinburgh Cadenhead shop by choice. Recently, Jason has used his experience and passion for whisky history, to write for websites and offer the Fife Firsts tastings during the Fife Whisky Festival. Joining our editorial team in 2019, is Abby. Abigail (Abby to whiskey lovers) grew up in the southeastern US, graduated from UGA with wanderlust after studying Spanish in Buenos Aires, discovered wine, whiskey and other fun living in Las Vegas, and finally settled (psych!) for living abroad, first in Beijing, next in Kuwait, and for now, near Shanghai, China. While originally and always a bourbon fan, she claims no alliance to the current administration, and is an equal opportunity learner when it comes to whisk(e)y. Her day job is teaching English to teens in China while enjoying the country’s nascent whiskey market, where limited-edition, Europe- and international-only releases go unnoticed by the public in favor of Jack Daniel’s and Johnnie Walker. In Abby’s mind, that = #winning. She also writes for the Bourbon Zeppelin. Who the hell reads Malt? Currently, each month Malt gets anything up to 50,000 visitors reading from all over the world – mainly the UK and US, with a decent proportion in Germany and France too. In the past year, we’ve had about 400,000 unique visitors on the site, with well over 1,000,000 page views in all. Just bookmark the site, or subscribe to our posts. Though the subject might be intimidating at first, there’s no substitute to just throwing yourself into whisky (figuratively, not literally, although that may help too) and learn a little each week. Our posts don’t assume you know everything, so you’ll easily be able to pick things up as you go along. And if you’re a whisky geek, may you enjoy the ride.